BaZOOka Picnic – brings the FUNK, the whole FUNK, and nuthin’ but the FUNK. Inspired by James Brown, Prince, and Parliament Funkadelic, every BaZOOka show turns the dance floor into a party with their irresistible brand of instrumental funk that combines epic grooves with soul, hip–hop, vocal riffing. 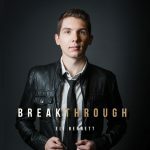 Main sax–man Eli Bennett is a 35–time award–winning saxophonist and has performed twice at the GRAMMY Awards in Los Angeles and has shared the stage with the likes of Oscar Peterson, the Neville Brothers and Coolio. Hailing from Vancouver, Canada, BaZOOka has taken Vancouver’s music scene by storm and has packed music venues and dance floors since forming in 2014. Inspired by James Brown, Prince, and Parliament Funkadelic, every BaZOOka show turns the dance floor into a party with their irresistible brand of instrumental funk that combines epic grooves with soul, hip–hop, vocal riffing, jazz harmonies and leaves audiences screaming for more. Fresh off the heels of a 2015 residency at Gastown’s iconic music venue Guilt & Co., every show was not only sold–out, but had a lineup down the block for a chance to dance to the funk. In addition to performing at The Backstage Lounge, Studio Records, The Fox, and the Hindenburg, BaZOOka has rocked every type of event, from performing two sold–out shows at Vancouver’s Queen Elizabeth Theatre for over 6,000 people, to private luxury galas at Vancouver’s Westin Bayshore, to frosh–week events for a thousand screaming college fans at UBC, to the Vancouver Jazz Festival’s “Winterruption” series at Granville Island’s Performance Works, to featured concerts at Big White Ski Resort in Kelowna. In 2016, BaZOOka was also the house band for The Leo Awards in Vancouver, B.C.’s film and TV Awards Celebration. Whatever the venue, BaZOOka Picnic BRINGS the FUNK. 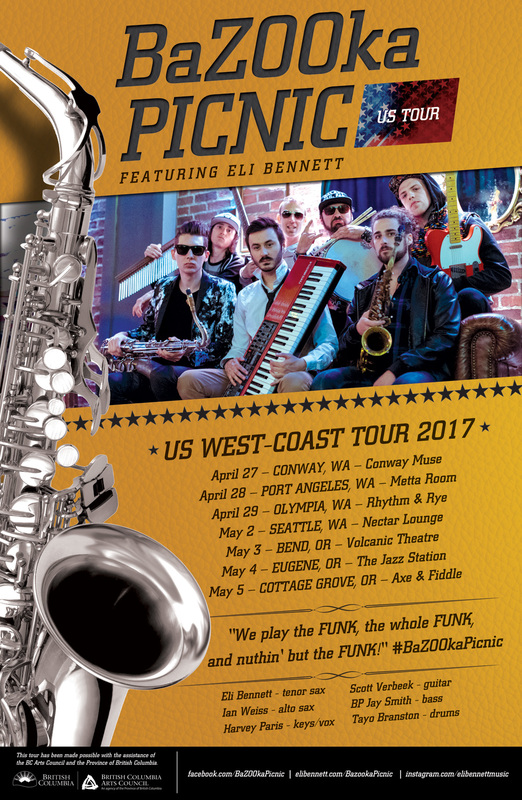 Boasting an all–star lineup, BaZOOka features 35–time award–winning jazzfunk saxophonist & solo artist ELI BENNETT (tenor sax), TAYO BRANSTON of JUNO–NOMINATED Five Alarm Funk (drums), SCOTT VERBEEK of Kutapira (guitar), HARVEY PARIS of BannaFish Orchestra (keys & vocals), BP JAY SMITH of The Ponderosas & Five Alarm Funk (bass), and IAN WEISS of Giraffe Aftermath (alto sax).